Create instant glamorous long hair in less than 5 minutes. The Clip-In Weft Set, made of 100% Memory®Hair, invisibly adds length, volume and color to your natural hair. Change your hairstyle from pith less and limp to blasting volume with this essential fashion accessory; the Clip-In Weft Set! Quickly and comfortably apply lustrous length, volume and color. Featuring the patented Soft Blend Edge, the Clip-In Weft Set glorifies your hair in just 5 minutes. You can now have the voluminous, long and flowing locks you’ve always dreamed of. The Clip-In Weft Set (45 cm) contains 5 strips of hair extensions which can be clipped in easily and result in a perfect natural and voluminous look. Backstage secret: Use the Professional Balmain Straightener (max. 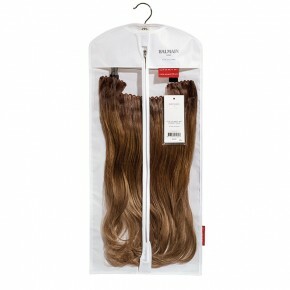 160°C/320ºF) to create beautiful straight hair or flowing curls to give your hair that extra bit for a special occasion!